I first tasted Scotch Eggs at the now-closed Sherlock’s Home pub in Minnesota. While Brit’s Pub, downtown Minneapolis, still makes them, theirs have just never tasted as good to me as Sherlock’s. Had I known Sherlock’s was closing when it did back in 2003, I would have begged them for their secret recipe. However, thanks to my friend Chef Don Messina, chef and former proprietor of The British Market in Naples, Florida, I now have my own secret recipe! Here is my version of his recipe, with a couple of my own little tweaks from British cookbooks. If time allows, allow both the hard boiled eggs and the sausage to come to room temperature before beginning. Mix together the sausage, onion, sage, mace and thyme. 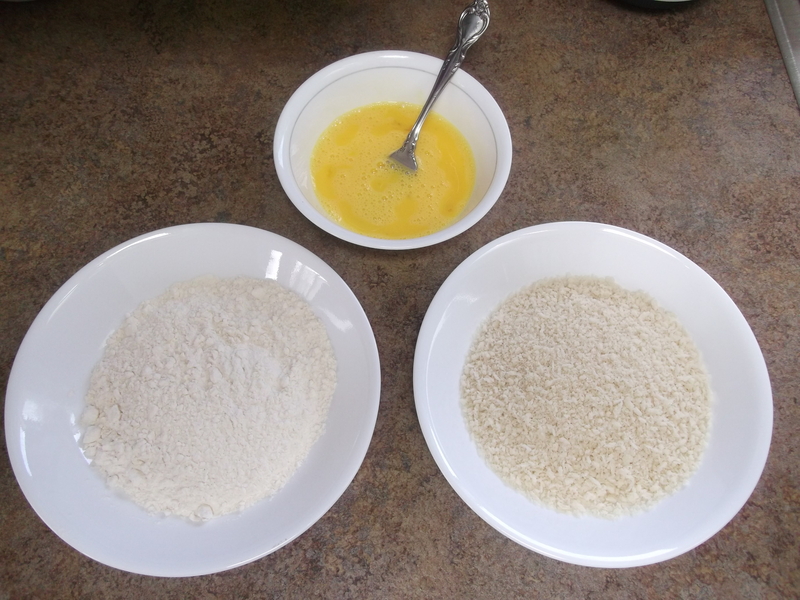 Get three bowls (wide, shallow bowls work best for the dry ingredients): Place the flour in the first onw, beat the two eggs in the second, and place the breadcrumbs in the third. Divide sausage mixture into four equal portions. 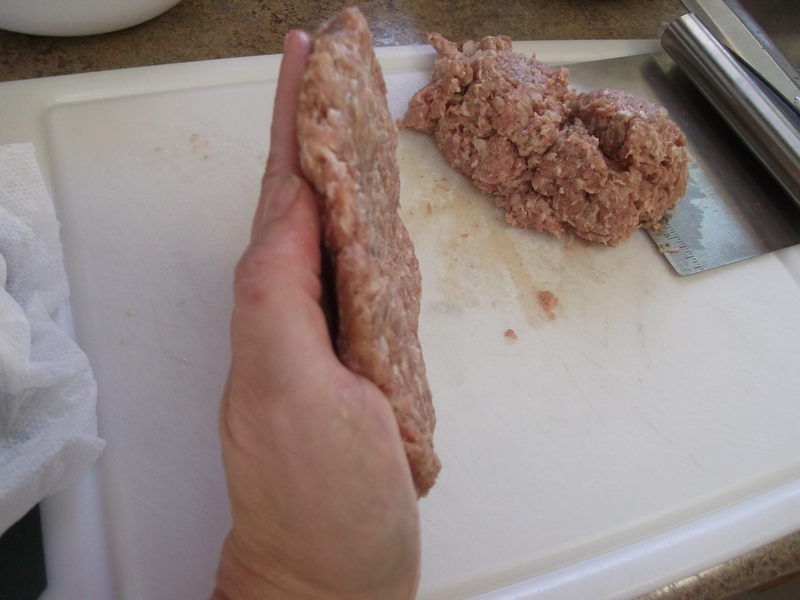 Pat out one portion of sausage into a thin patty over the length of your palm. 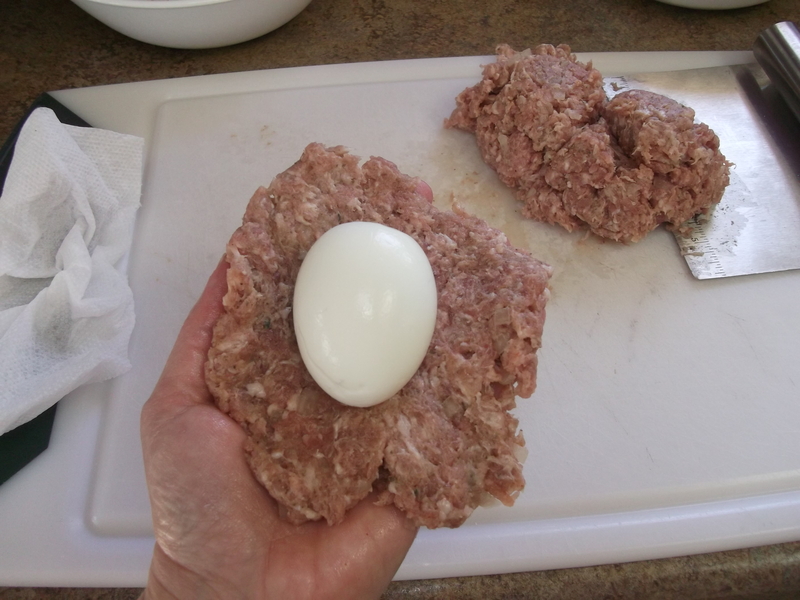 Lay one egg on top of sausage and wrap sausage around egg, sealing to completely enclose. Repeat with remaining sausage and eggs. Working gently with one sausage-wrapped egg at a time, dip it first into the flour, shaking off excess, then coat in egg wash, then roll in breadcrumbs to coat. Set aside until all eggs are breaded. 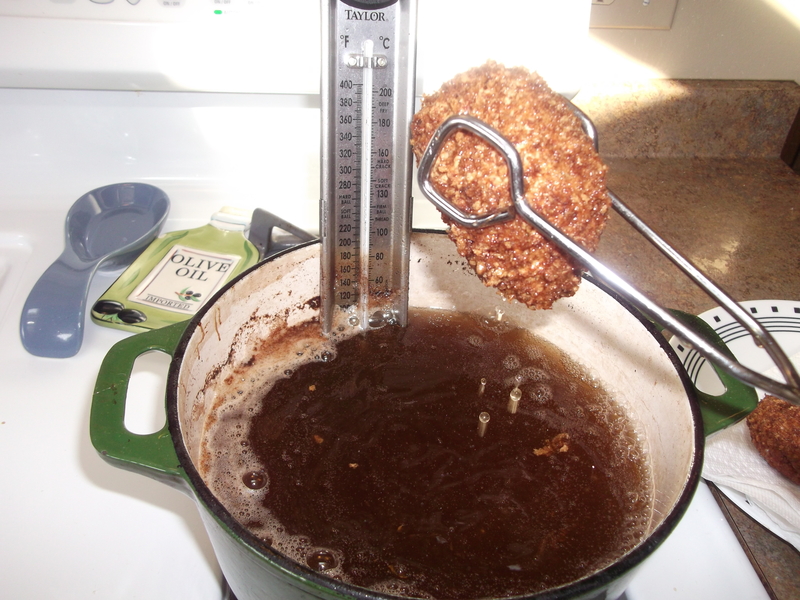 Heat deep fryer to 350° F. Fry eggs, maintaining oil temperature of 350° F, until sausage is cooked through and breading is golden brown and crisp, about 5 minutes. Use a slotted spoon to transfer eggs to paper towels to drain. Make the mustard sauce by whisking all the ingredients together in a small bowl. Slice cooled eggs in half lengthwise and serve with the mustard sauce. After hard boiling the eggs, allow them to cool. Next, prep the pork mixture. Mince enough onion to obtain about ¼ C, and chop the thyme leaves to get about ½ t. Measure out ¼ t to ½ t each of the sage and the mace, but feel free to adjust the amount of any of these herbs to suit your taste. Place the pork in a small bowl and add the onion, sage, mace, and thyme. Now it’s time to get your hands dirty — literally. The easiest way to mix it really well is by using your hands and fingers. Yes, it’s messy and it’s squishy, but you gotta get your hands dirty with this recipe. It’s worth it! NOTE: If making ahead, refrigerate the mixture until ready to use, but allow it to return to room temperature, before using. Doing so will make it a little easier to work with and will also help keep the oil temperature as close to 350 as possible while frying. Place the flour in a wide shallow bowl and the breadcrumbs in another wide shallow bowl. Whisk the two eggs in a medium bowl. Divide sausage mixture into four equal portions. Pat out one portion of sausage into a thin patty over the length of your palm. Keep it about ½” thick. 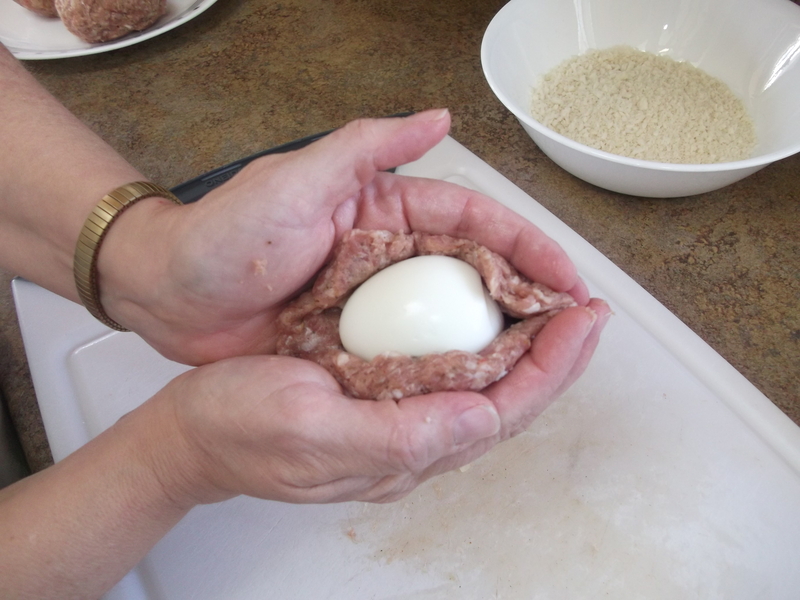 …and, making a “book” with both hands, wrap sausage around egg. Seal to completely enclose. Repeat with remaining sausage and eggs. Note: if you feel like you have too much (or an uneven amount of) sausage along the seam, or on the ends, just pinch it off and set it aside. 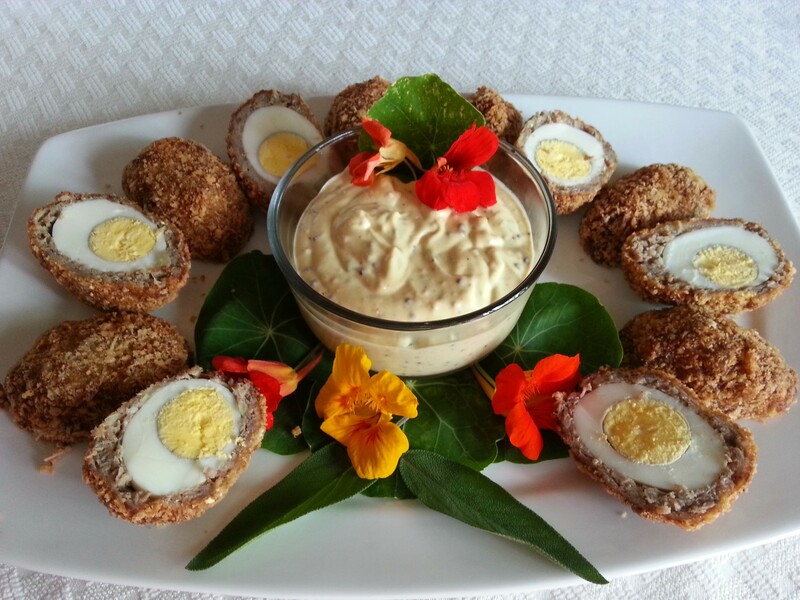 You may find you have enough left to form one more egg – nothing better than a bonus Scotch Egg! Just make sure you keep ½” of sausage around the egg. You don’t want it too thin or coming apart, exposing the egg. Working gently with one sausage-wrapped egg at a time, dip into the flour, coating well and shaking off the excess. You want just enough flour so the egg wash has something to stick to. Next, coat the floured egg in egg wash. Coat it, but don’t soak it. You want it just wet enough that the breadcrumbs will stick: too much and it will get gloppy and wet. Lightly shake off any excess. Finally, roll in breadcrumbs to coat well, shaking off any extra. Repeat with each egg. Heat deep fryer (or a deep, heavy-bottomed pan filled halfway with oil) to 350° F. Make sure to wait until it is at 350°, even if it looks really hot or seems like it has been heating a long time. 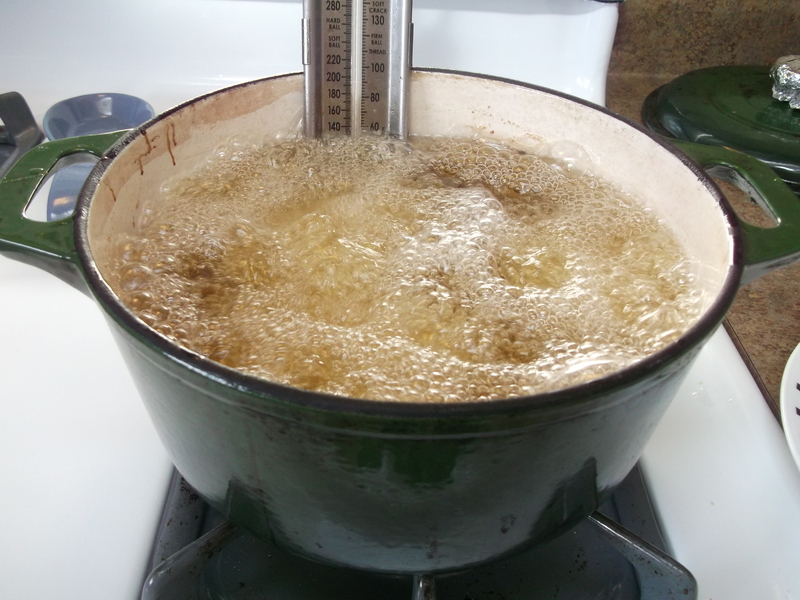 Use a candy thermometer and wait for it. I know you want to dig into these eggs as soon as you can, but if the oil isn’t hot enough, the eggs will just absorb the oil rather than crisp up in it, making them greasy and soggy. Yuck! NOTE: learn from my mis-experience and be sure to leave lots of room at the top of your fryer/pot. Once you add the eggs the oil level will rise, both from displacement of the eggs from the rapid boil that ensues. If too full, the oil can overflow: all over your stove, and into the flame. Obviously this is a huge safety hazard, in addition to a monster mess to have to clean up later. Needless to say, when I made this mistake I did not stop to make time to take photos. Well, maybe one. See the Bloopers page. If you haven’t overcrowded your pot, you shouldn’t really need to turn the eggs while they cook, but you can if you want. Be sure to maintain the oil temperature at 350°, and cook until sausage is cooked through and breading is golden brown and crisp, about 5 minutes. Use a slotted spoon or tongs (gently!) to remove eggs and gently shake off any excess oil. Transfer eggs to a plate lined with several layers of paper towels. Let them cool on the counter until nearly room temperature (45 minutes or so). This is the most difficult step of this recipe: waiting for these to cool while the delectable aromas tempt you and their crispy outsides beg you to just take a bite. Either leave the room or put the eggs in a different room and try, try, try to forget about them for a while. Distract yourself by making the mustard sauce: just whisk all the ingredients together in a bowl. Taste it, and add a little sugar if you want to to tone it down or add more mustard to give it more kick. Feel free to experiment with different types and amounts of mustard. There’s no right or wrong way to make it as long as it tastes good to you. When the eggs cooled to about room temperature, go ahead and try one, or place them in the refrigerator until ready to serve. 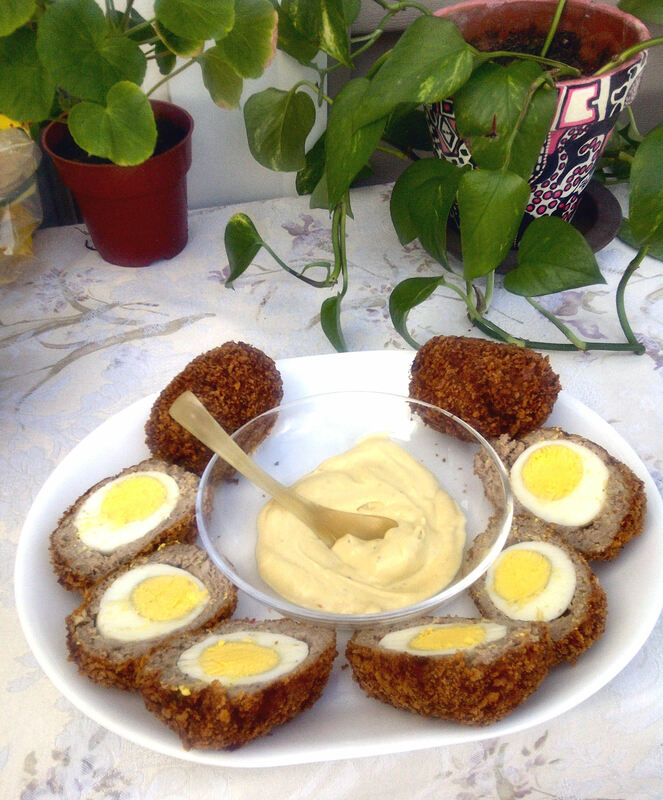 Slice cooled eggs in half lengthwise and serve with the mustard sauce. Enjoy! 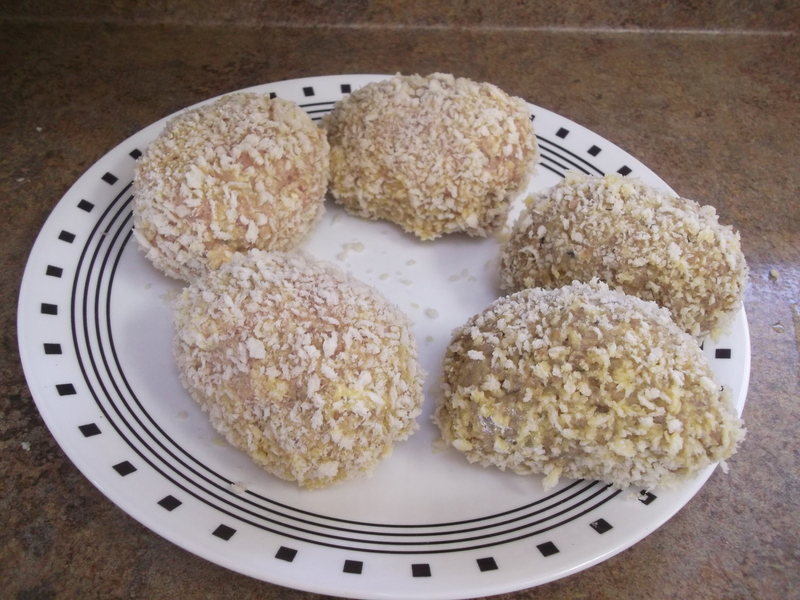 We had Scotch eggs on a trip recently…now I have a recipe. Thanks! Try using Alton Brown’s breakfast sausage recipe as the sausage mixture. I roll the boiled eggs in flour, then cover with sausage and then just roll in breadcrumbs pressing them into the sausage for the shaping. For some reason, I get about 10 eggs coated to 1 lb of sausage meat. Love them! As a Brit, I am always able to get good Scotch Eggs in small cafes or farm shops. 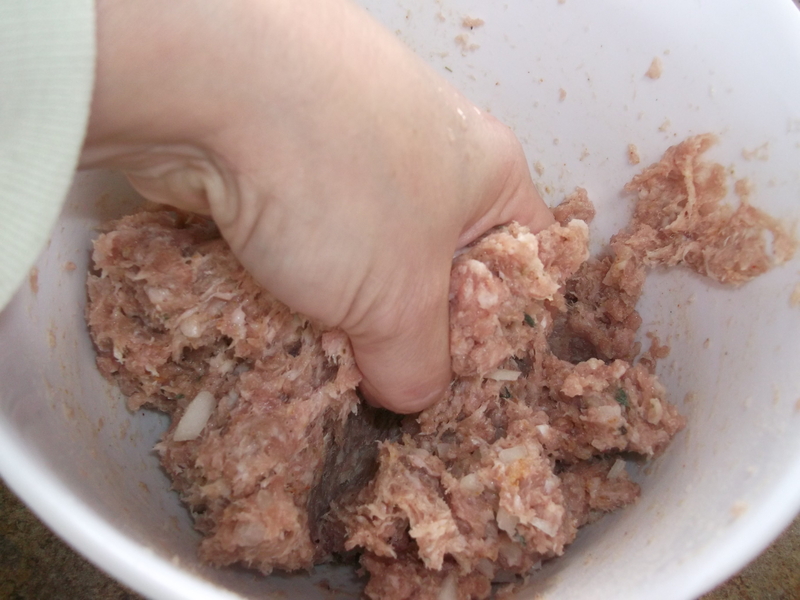 Try mixing apple and sage, or pear and leek with the pork forcemeat, or you can even use haggis. A real touch of decadence is to soft-boil the eggs with the yolk just runny in the centre. Visually this is stunning for free-range eggs with deep golden yolks. I have been wanting to try the soft-boiled version, as I’ve seen that in photos and it looks amazing! I usually make these to serve later, so next time I’ll soft boil a couple for immediate enjoyment!